At first the article makes it seem like ApplePay on the device is broken. But it seems the human element involving the credit card companies is the problem here. One common mistake people make when cooking scrambled eggs is adding milk or cream. You may have been whisking your eggs with milk since you were a little kid, but we're telling you now: It's time to stop. It may seem counterintuitive, but the addition of milk, cream or any other liquid for that matter, will actually make it more likely that your eggs will turn out dry. By thinning out the eggs, it's easier to overcook them. Most importantly, the milk dilutes the taste of the eggs. It also screws with the texture, leaving the eggs slightly rubbery -- and no one wants rubbery eggs. If you're using good, farm fresh eggs, you don't need anything except maybe a little salt and pepper to make them taste delicious. A little butter never hurt anyone, either. I'm never sure how to take these articles that tell you that you've been doing it wrong. You know the ones, like you're eating this food wrong or using this tool wrong. We have been making more and more scrambled eggs since the kids enjoy it this way. Me? I prefer a good over easy egg. I was always felt great knowing I shared a birthday with Mr. Spock. As has been said on the interwebs today, he did live long and prosper. I took this 90 second video when I picked up Graecyn and Mia at Mama and Papa's house. Graecyn was in a conversating mood. The upcoming 12-inch Air has the fewest amount of ports ever on an Apple computer, as can be seen in the rendition above. On the left side is a standard headphone jack and dual-microphones for input and noise-canceling. On the right side is solely the new USB Type-C port. Yes, Apple is currently planning to ditch standard USB ports, the SD Card slot, and even its Thunderbolt and MagSafe charging standards on this new notebook. We must note that Apple tests several designs of upcoming products, so Apple may choose to ultimately release a new Air that does include the legacy components, though there is very little space on the edges for them. My first Apple laptop was a 12-inch PowerBook which I loved. My wife wondered why I didn't get the 15-inch or 17-inch which were other options. I said it was something about that 12-inch PowerBook that looked and felt right. I don't think Apple would ditch the Thunderbolt connection and MagSafe both. Seems like a bit much, but I suppose it's possible. Only time will tell. Very touching IKEA holiday commercial. Not too sure how I feel about this. I suppose it could be a worse title, right? I'm hoping that when the movie comes out that the only thing we needed to worry about is the title. Mia having fun during Susana's birthday celebration. We were upstairs just finishing watching Susana opening her presents, when Mia decided to leap from a chair to a few pillows. This was captured with an iPhone 5S. Sure wish I had an iPhone 6, which can do 240fps vs the 120fps a iPhone 5S can do. The girls are in the City once again. Farrah sent me the above photo from the Palace of Fine Arts. I wish I could be up there with them enjoying the day. I had a similar conversation with Comcast when I was simply trying to find out how many Filipino stations they offered. DirecTV offers eleven Filipino stations. Comcast only offers five. I simply asked if they would be offering more, but the representative avoided the question and started talking about their other channels and how much better they are then DirecTV. The one-sided conversation took off from there. The Comcast person started talking about pricing, channels, and other features that I was not interested in. When I pushed back he would ask, "Why?" "Why aren't you interested in this great deal?" "Why do you need more Filipino channels?" Perhaps because those channels are being watched by someone in my house?!?!? It took some time with me becoming more agitated to be able to pry myself off the phone. I think I finally hung up on them as I simply said, "You are not listening to what I am wanting and asking about, so this conversation is over." I understand the person was trying to make a sale, and I was the one who called Comcast. But to turnaround and try to thrust their services on my was very off-putting. Listen to the below call. But be warned: you might get a little agitated after listening to it all. This is a simple story of a bad customer experience turning into a worse one by the day. My truck battery was on its last legs. I managed to get it charged so I drove it to the closest Sears Auto in Cupertino. I was able to be checked in fairly quickly about 11am, and told my car would be done a little after noon - or within the hour. This sounded great. The mall in Cupertino isn't that great, so I called Farrah who, with the kids, picked me up at Sears. We decided to have lunch at the local park and let the kids play. This provided a couple of hours of fun, more than enough time to get the battery changed in the truck. It was strange, though, no one called from Sears Auto during the time we were at the park. As we started driving back I began to wonder if they even started work on my truck. It was a little after 1:30 when I got back to Sears Auto. I saw my truck in the same spot which concerned me a little. But then I though, well all they need to do is pop the hood, disconnect the old battery and put in the new one. They shouldn't need to move it far. In any event I stood in line to talk to one of the customer representatives. I stood in line for about 30 minutes, a line only 3 people deep, before I got to talk to what apparently was the one working representative. This was strange because earlier in the day, just a few hours ago, there were at least three representatives working. The representative told me that they hadn't gotten to my truck just yet but it should be done soon. He would make sure. I was a bit peeved, but was able to occupy my time with Farrah and the kids by going across the street to do some grocery shopping. This ate about an hour of time. I asked Farrah to drop me off and just head home with the kids, thinking the truck would be done. Boy was I wrong. And this is why I probably won't shop @Sears any longer. Unfortunately, according to Sears I was sending my tweets to the wrong account. Instead of @Sears I should be sending tweets to @SearsAuto. Silly me. I thought that a service with the name Sears would be concerned about the bad customer experience several people were experiencing. @al3xgiron Hi, we've passed on your note. Thanks for your patience! But they have been silent ever since. I don't believe I will be hearing from them. Even if I did I suppose I would only get some half-hearted apology with no rational explanation for the problems experienced by the many people that day. Thinking back on what could have been done differently by anyone at Sears Auto that day I could only come to this conclusion: they should have set expectations appropriately. If they couldn't do the work in a timely manner, then they shouldn't have promised it could be done. They should have stopped taking new work in. Continually building up the workload for the amount of workers they had only frustrated the customers. I am guessing this trend will continue at Sears, uh I mean, Sears Auto. In any event Sears, as a whole entity, has lost me as a customer. The KizON wearable also features a ‘One Step Direct Call’ button, which lets parents contact their children easily. If the kid fails to answer a call from any pre-set phone numbers within 10 seconds, KizON will automatically connect the call so the parent can listen through the built-in microphone. Kids can also dial a pre-configured phone number in case they need to speak to an adult. Good idea, but the device is too big. I don't think it will fit on my kids' arms. I don't think I can convince them to wear this either. I always knew I would have girls, just a feeling growing up with two sisters. I know they'll have problems like any other kids. I hope they will know that being a girl is a good thing. For several months, Amazon has been quietly discouraging the sales of Hachette’s physical books by several techniques — cutting the customer’s discount so the book approaches list price; taking weeks to ship the book; suggesting prospective customers buy other books instead; and increasing the discount for the Kindle version. Good thing Amazon has competition, right? 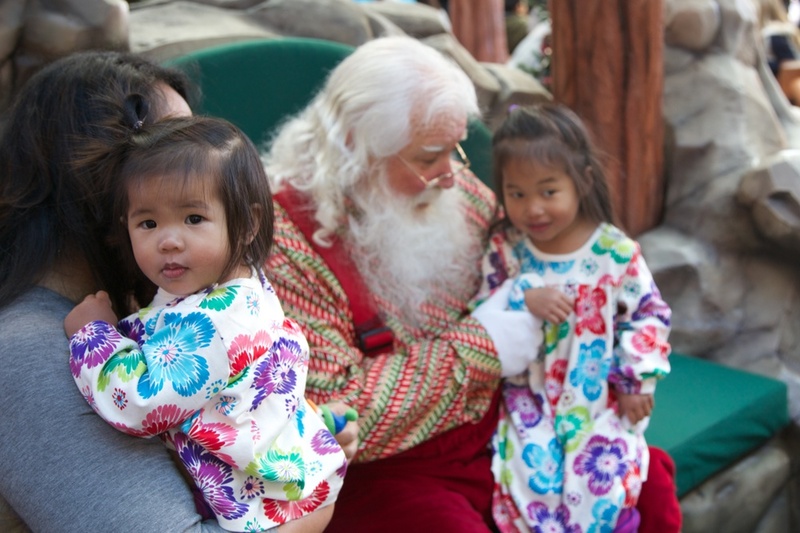 The Santa Claus at Stanford Shopping Center has been our staple Santa over the years. The only other time we saw Santa Claus elsewhere was in Hawaii. This year we waited until the weekend before Christmas to visit Santa. It seemed like a lot of other people had the same idea, given the long line we encountered early that Saturday morning. But the girls were very patient waiting. And when it was their turn to sit on the jolly old fellow’s lap, the girls were well behaved - for the most part. I think Graecyn is going through a little stranger danger / separation issue right now. But Mia was all in awe of Santa. Mia even spent several moments after the photo session talking to Santa about her gift ideas. Mia tells Santa her wishes for this year. Fan comic take on Batman and the Joker's last dance. A bit bloody and violent, but worth a quick read if your a Batman fan. Decent article on Ars Technica about what I'm doing now - an iPhone user using a Nexus 5. I hope to write a few words about this in the weeks to come. But the (pain) points about the process is well covered in the linked article. It's always tough getting the girls ready in the morning. Sometimes they place nice, like this morning. This gives mom and dad the opportunity to actually get ready for work and instead of rushing to work.